Back in June we mentioned that the Tokyo International Bar Show (which I reviewed here) included a number of interesting bottles this year, from both Scotland and Japan. 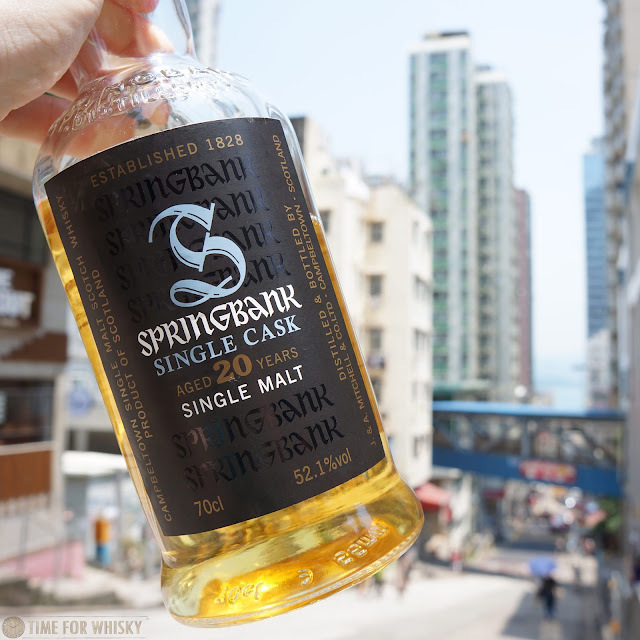 One of those was this Springbank - a 20 year old single cask, bottled exclusively for the show, from a "Fresh Sherry" cask. One of 492 bottles, it was distilled in May 1995, bottled in April 2016, and weighs in at 52.1% ABV. You might think (as I did at first) that a single cask 20yo ex-sherried Springer might be somewhat dark...so I was pretty surprised when I saw it at the show. The colour was much lighter than expected - perhaps a 3rd/4th fill, or from an ex-Fino cask, or both? Nose: Rubbery at first, with some stone fruits (peaches, nectarines). There's a bit of brine / saltiness, and some hints of sweet jam. Palate: Rich and bold up-front. The brine follows through onto the palate, quickly followed by big jammy donut notes. Like a sweet, sugary glazed donut filled with raspberry jam filling. Not really any discernible peat, but there's a bit of earthiness / vegetation towards the end. Finish: Long and earthy, whilst retaining some of the jammy sweetness from the palate. Rating (on my very non-scientific scale): 92/100. A delicious, though unusual whisky. Certainly not the sherry bomb I'd expected, but that's not necessarily a bad thing. A fine example of a brilliantly made, though slightly left-field Campbeltown whisky.